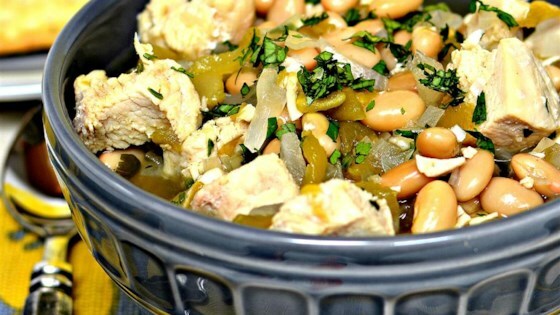 "A simple chicken and bean soup with a little kick. This soup is great on a cold evening after a busy day. This recipe was shared with me by a friend I truly miss." Heat olive oil in a large pot over medium-high heat. Saute onion and garlic in hot oil until softened, about 5 minutes. Remove onion and garlic to a small bowl. Stir chicken into any remaining oil in the pot; cook and stir until completely browned, 5 to 7 minutes. Return onion mixture to the pot; add beans, broth, chiles, cilantro, salt, and cayenne pepper. Bring the soup to a boil, reduce heat to medium-low, and cook until the beans are very tender and the chicken cooked through, about 20 minutes. A simple, hearty chili inspired by the flavors of old Mexico. You can increase the broth and the beans by 1 can each to make extra. It was a little salty so I may try again with a reduced sodium broth. Since I do not care for cilantro, I substituted parsley. The soup is not very flavorful, you can just taste the cayenne pepper that adds heat. Will add a little taco sauce when serving. This is really good and easy. I used low sodium chicken broth and added cumin too. We love this recipe. I never would have tried chili's. Awesome soup.